For the first time in almost 70 years, civil rights icon Dr. Clarence B. Jones made his return to Palmyra. 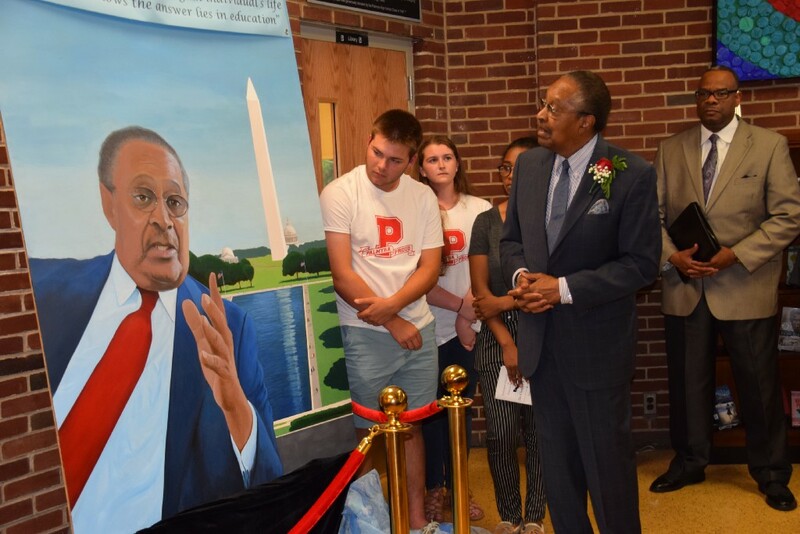 Dr. Clarence B. Jones was visibly moved to see his own likeliness on a mural outside the Clarence B. Jones Library at Palmyra High School. The mural was designed by PHS students in anticipation of Jones’ arrival on Tuesday, June 6. From left: PHS junior Brett Maute, junior Carolyn Vanartsdalen, junior Jenelle Belton, Dr. Clarence B. Jones and Palmyra Board of Education vice-president Keith Austin. When Dr. Clarence B. Jones saw Palmyra High School on Tuesday, June 6 for the first time since graduating in 1949, the sight opened a floodgate of memories. He said in that moment, he thought about his parents, the Catholic nuns and the teachers at Palmyra High School who laid a strong foundation for his success. “It was a combination of emotion, and also, it was a combination of gratitude — gratitude that I’ve been providentially blessed to live long enough to come back after almost 70 years,” Jones said. Jones, the 1949 valedictorian of Palmyra High School and an attorney who served as personal counsel, advisor, draft speechwriter and close friend of Dr. Martin Luther King, Jr., returned to his alma mater Tuesday morning for two days of commemoratory events. On Tuesday morning, Jones’ visit kicked off with an assembly during which he spoke to Palmyra High School students. A dedication ceremony followed later in the day at which the previously unnamed Palmyra High School library was named the Clarence B. Jones Library. History teacher Daniel Licata and his team of mural artists — PHS students Brett Maute, Jacob Wolfe, Sean Stocker, Carolyn Vanartsdalen and Jenelle Belton — revealed a mural of Jones that will be mounted outside the library to give a face to the library’s new name. Palmyra resident Valerie Still, a historian with the Dr. James Still Preservation Trust, contacted Jones following the passing of her mother Gwendolyn Ricketts in 2010. She reached out in the hope of getting some information about her mother who had been in the same grade as Jones. Still kept in touch with Jones and ultimately created two scholarships through the Dr. James Still Preservation Trust in 2013. One scholarship was in her mother’s name, the Gwendolyn A. Ricketts Scholarship, and the second was in Jones’ name, the Dr. Clarence B. Jones Scholarship. Still, along with Superintendent Brian McBride and Licata, began discussing a permanent way to honor Jones at Palmyra High School approximately a year ago. McBride said from the beginning, he and Licata wanted Palmyra students actively involved in the planning of Jones’ visit, and so Licata guided his students as they designed a mural to hang outside the library, researched Jones’ life for a plaque and crafted press releases to get the word out about Jones’ visit. Jones said he has received honors from Kennedy Center of the Performing Arts, the British Museum of Art and former President Obama, but few things meant as much to him as being honored by his alma mater. 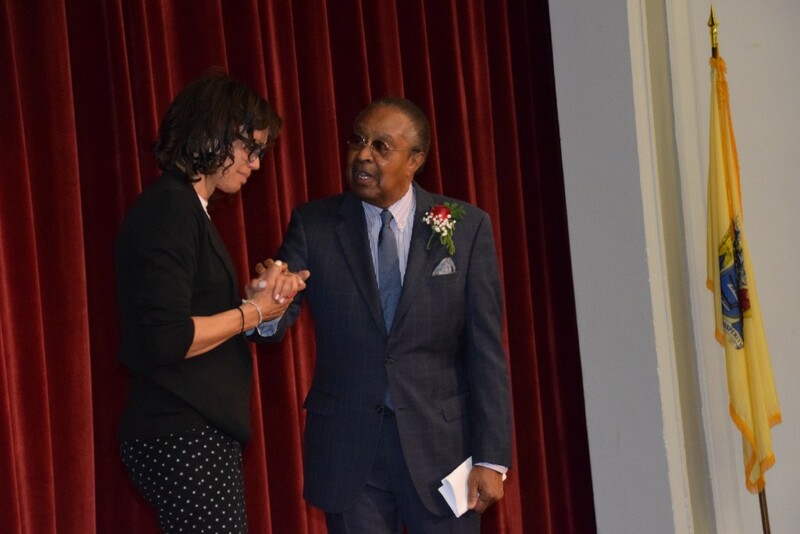 “By affording me the opportunity for me to come back and to honor me, you have also afforded me the opportunity to do what I’ve wanted to do for 70 years — publicly acknowledge my parents,” Jones said. Jones shared his early years with the students gathered at Tuesday’s assembly and those in attendance at the dedication later in the day. He said his parents were live-in domestic servants with little education who did not own a home of their own. They sent him to a boarding school at the age of 6, where he said he stayed until returning to attend Palmyra High School at 14. “There are real problems you will face as you go forward in the world, but I’m suggesting to you that you develop an inner compass and gyroscope to anchor yourself in a cement mold of self confidence,” Jones said. Every morning, the Irish Catholic nuns told him he was good and loved — a message he carried with him when he returned to Palmyra High School. Having spent the last several years having formed loving relationships with white nuns, he said he didn’t quite understand it when he came to Palmyra High School and white students were sitting on one side of the cafeteria and African American students on the other. He formed his own third group establishing friendships with both both black and white students, which he said is probably the reason he was voted most likely to succeed by his peers. Despite being a gifted student, Jones’ plan was to join the Navy out of a concern he couldn’t afford college, but when a teacher at Palmyra High School caught wind of that, the teachers at PHS used money out of their own pockets to fund Jones’ college applications. He received a scholarship to Columbia University where he would attend for his undergraduate years before going on to Boston University for law school. Jones travelled to California to practice law following graduation where he was approached by King’s team to work on his tax evasion case. Ultimately, Jones would go on to pen part of King’s “I Have a Dream Speech” and became a close friend and confidant to King. “Dr. Jones wrote and Dr. King spoke,” Licata said of the infamous speech. For seven and a half years, Jones was King’s personal lawyer and speech writer, and he said if he did not have a foundation of self confidence and education, he wouldn’t have had confidence to respond to King when he asked him to work by his side. He told those in attendance Tuesday he is not some kind of exception coming out of Palmyra. He said the next Clarence Jones is at Palmyra High School right now. “Sitting among you are more Clarence Joneses and their female equivalent Clarice Jones,” Jones said.